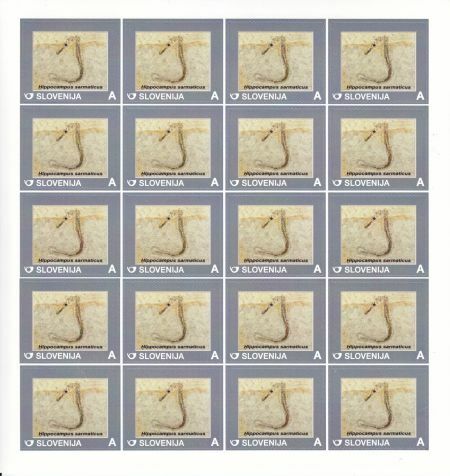 Slovenia 2014 "Discovery of sea-horse fossil at Kamnik–Savinja Alps, Slovenia"
On April 20 2014, Philatelic Club Ivan Vavpotic Kamnik, Slovenia issued commemorative self-adhesive stamp. 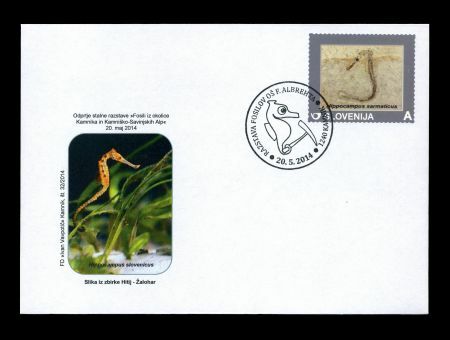 The stamp is based on photo of discovered fossil made by mr. Hitij and shows fossil of sea horse - the oldest sea-horse found to date. 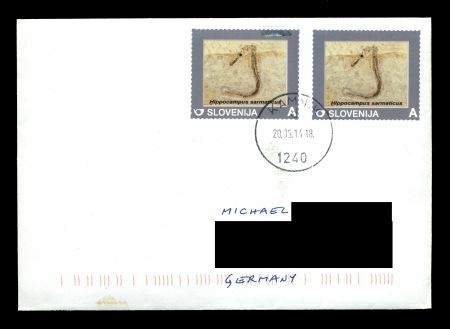 The fossil was uncovered in April 2009 at Kamnik-Savinja Alps by two Slovenian paleontologists ( Jure Žalohar and TomazÿHitij ) from Slovenia's University of Ljubljana who were originally investigating fossil insects in this area, so finding the fossil seahorses was "completely unexpected," they said. 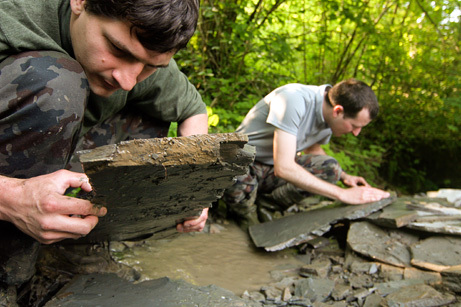 Jure Žalohar first spotted a fossil in the water as he was washing his hands in a stream after a jog. 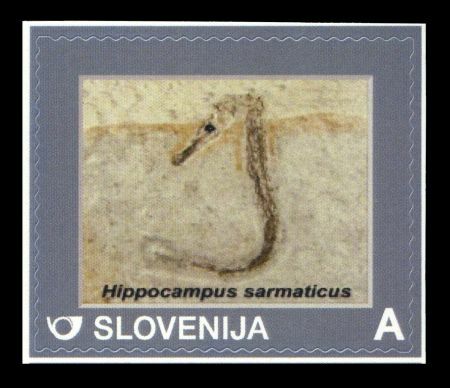 Hippocampus sarmaticus ("Hippos" means horse while "kampos" means sea monster. 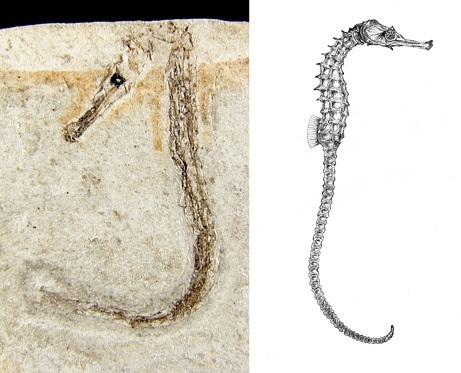 ), this 13-million-year-old baby seahorse fossil, with a head measuring just 5 millimeters long, is among the oldest seahorse fossils ever discovered. 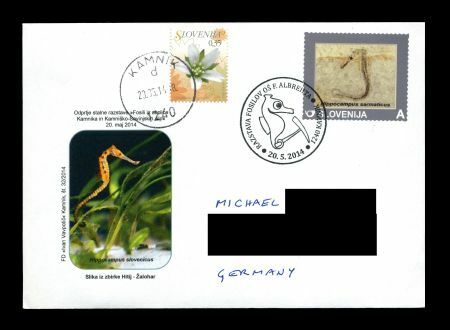 Earlier seahorses likely lived in the temperate shallow coastal waters of the passageway between Europe and Africa that linked the Atlantic with the Indian Ocean until about 15 million years ago, the researchers say. That passageway would have helped the fish slowly spread around the globe. They probably dwelled in dense beds of sea grass, where food such as small crustaceans was abundant. The seahorses' black flecks would have camouflaged them in the vegetation, which the fish also likely anchored themselves to using their prehensile tails. The new finds suggest that the fish could have held onto floating clumps of sea grass for weeks or months with their prehensile tails. If caught in a current, these rafts of sea grass may have carried the seahorses as far as 260 kilometers in a month, possibly explaining how the poor swimmers were able to spread around the globe.